November 11, 1886, Mamie Kelly's body was transported by wagon from the morgue to her home on Hayes Street. Her funeral was scheduled for Saturday morning, November 13. The entire city was preparing. The night before the funeral several women had rushed the Goldenson home and in an act of frustration tore shingles from the house. The police who had been on duty on the street to protect the Goldenson's home and insure some measure of peace for the Kelly family stopped the women and removed them from the premises. Unfortunately the Goldenson family made the decision to move from their home on Hayes street the same day as that of Mamie's funeral. Crowds had already gathered on the street for the funeral; as the family attempted to move their possessions they were attacked and their furniture smashed. The police and others intervened allowing calmer heads to prevail and the Goldenson family was allowed to leave. Mamie's funeral was held at St. Joseph's Church on Tenth Street, near Howard. Early that morning, as her body left her home on Hayes Street for the last time, thousands of people lined the street. The city's collective grief was evidenced by the enormity of the crowds in front of the church and for blocks surrounding. The police were in attendance as well, but fortunately for the family the crowd remained orderly. The coffin covered in white flowers was placed in the front of the church. The services were conducted by Rev. Father Seanlan. Father Seanlan gave an eloquent eulogy doing his best to console the grieving family while assuring the huge crowd that justice would punish the murderer and that it must be done in a lawful manner. When the services concluded the students from Mamie's class at John Swett elementary school were allowed to stay behind with the family and take one last look at their murdered classmate in her coffin. It was estimated that the crowd at the funeral numbered five thousand San Franciscans. Following the funeral services a procession formed in front of the church and began the solemn march to the Catholic Cemetery at Lone Mountain. Vehicles lined the roadway for two thirds of a mile. Thousands of people were present for the interment at the cemetery. Hundreds of bouquets were thrown into the open grave as an entire city of mourners paid their last respects. The Coroner's Inquest was conducted the day following the murder. A crowd numbering 10,000 waited outside the Morgue for the verdict. They openly discussed the crime and looked up at the open windows hoping to catch a glimpse of the murderer or the victim's family. The Coroner's jury returned a verdict finding that Goldenson had murdered Mamie Kelly with deliberation and malice aforethought without cause and charged him with a "cold-blooded murder." On his way to the jail it was said Goldenson discussed the murder in a cool and collected manner stating that Mamie was annoying and he couldn't get rid of her without killing her. Goldensons' perception of his relationship with Mamie would change during his time in jail. At the same time the Coroner's inquest was being conducted the Grand Jury was indicting Goldman. The morning of Mamie's funeral Goldenson was in court being arraigned. This was the beginning of Goldenson's life and death struggle in the San Francisco courts. His attorneys were zealous in their defense of the young man. They challenged the findings of the Coroner's Inquest and the Grand Jury indictment on technical legal grounds. Their motions were all denied. On the morning of Mamie's funeral, Goldenson was arraigned and pleaded not guilty to the charge of murder. District Attorney Wilson said he would be ready to proceed to trial the next Monday. Although the defense counseled against haste the Judge set the trial date for the following Monday. Based on the attempted lynching and the attitude the population of the city demonstrated on the streets and in the newspapers, Goldenson's attorneys requested a change of venue. Deuprey, Goldenson's attorney, argued that "no stronger case for a change of venue was ever presented to the bar in view of all the surrounding circumstances. Judge Murphy denied the motion, but during the impaneling of the jury it looked as if it was certainly going to be difficult to find a fair and impartial jury. Alex Goldenson's defense to the murder of Mamie Kelly was to be insanity. An insanity defense is always difficult and in this case was impossible given the time constraints and the attitudes of the day. Questioning the prospective jurors made that imminently clear, as seen in the selection of John K. O'Brien as a member of the jury. John K. O'Brien, a blacksmith, had known the deceased, Mamie Kelly, as well as her family. He had talked concerning the shooting with deceased's relatives. He did not believe in insanity as a plea. The defense challenged him, but the challenge was disallowed. Testimony from Russia was required for the insanity defense. Adam Danielewich, Burgermeister of Marianpol, was to take the testimony of Dr. Steorge Stragalifisky, Dr. Abram Levin, Chaye Hirsch, Moses Feigal, Peisha, Deborah, Hodas, Samuel and Gabrielle Goldenson that Goldenson's great-grandfather, grandfather, two aunts and one uncle were insane and that it was hereditary. Goldenson's attorney alleged that the defendant was the unfortunate victim of a disease inherited from his ancestors, that the ancestor whose bones were buried in foreign soil had given to "the miserable wretch now on trial his unfortunate condition of mind." That ancestor had been hopelessly insane for twenty-eight years. He argued that Goldenson himself had exhibited those same tendencies, hallucinated, assaulted people for no reason and had tried to take his own life. That Goldenson's own father exhibited memory loss and delusions. The testimony from Russia never materialized. The trial was made up of information that had already been given at the Coroner's inquest - eye witness testimony. Goldenson refused to assist his attorneys and often acted out in court. He was sullen and often irritated. His faithful mother Rebecca was there every day even though Goldenson had loudly ordered her from the court room on several occasions. Goldenson was found guilty and sentenced to death on April 14, 1887. The case was appealed to the California Supreme Court. They affirmed the judgment of the lower court. The United States Supreme Court refused to hear the case. Mrs. Goldenson fell on her knees before Governor Waterman of the State of California begging for a commutation of sentence for her boy. The Governor refused to interfere. What could be left? There was one final attempt by Goldenson's mother Rebecca to save her son. She filed a motion for guardianship based on her son's inability to care for himself due to insanity. It was held in a different court before a different judge than the murder trial. Had this judge ruled in her favor, that Aleck was insane, it would have started a firestorm of new proceedings and stopped his hanging. Clever had it worked. The court, however, ruled it did not have jurisdiction in the case. The last act in this complicated legal drama was Goldenson being taken into court on July 23, 1888, where his date for execution would be set. Goldenson's attorney asked the court to put as distant a date of judgment as the law would permit on his hanging. The reason for this request was for Goldenson's relatives, in particular his mother who had shown such unexampled devotion to her unfortunate son and wanted him with her as long as possible. "This is the only request of this heartbroken mother, who can not yet give up her boy," he pleaded. Judge Murphy set the date for execution as September 14, 1888. In the courtroom, Goldenson muttered an oath and loudly whispered to his attorney, "I knew it. The 14th is my fatal day. "The explanation for this statement will be revealed in Part III of this story. Sometime between firing the fatal shot and hanging for his crime Aleck Goldenson fell in love with Mamie Kelly. He fantasized that they had been star-crossed lovers who had intended to spend their lives together, marry, have children, and grow old together. A giant departure from the reasons he gave for her murder before and during his trial. Some things don't change regardless of their time in history. As today, in 1888, there were women who wrote to convicted prisoners on death row, traveled to see them, and believed themselves to be in love with the prisoners. Such was the case with a young blond woman from Salt Lake City who was notorious for her fondness for Goldenson and visited him daily. The press caught wind of it and Goldenson wrote a card which appeared in the newspapers denying the stories surrounding this young lady from Salt Lake City. Aleck said he thought it was wise to deny the tale especially in view of his feelings toward the dead Mamie Kelly. "I do not want the sincerity and the devotion of my love toward her to be tarnished by the faintest suspicion that I am ever unfaithful to her memory," he said. This must have been such a comfort to Mamie's family. SHERIFF'S OFFICE, CITY AND COUNTY OF SAN FRANCISCO - Mr. ______: You are respectfully invited to be present at the execution of Alexander Goldenson in the County Jail-yard, on Friday, September 14, 1888, at 12 M.
Present this at the door. Not transferable. The demand for invitations was unprecedented. The Sheriff had received in excess of five hundred personal requests and thousands more wanted admittance. Those who had supported McMann in his electtion and assured they would do so again pressured the Sheriff for an invitation. There were none to be had. Even the deputies complained that they had been denied their usual privilege of an extra invitation or two for friends. They said they could have easily sold the card for $5, but in truth some of the cards were sold for as much as $50. A photographer was sent to the jail to photograph Goldenson one last time. Of the two the photographer was far more nervous. I have searched for this photograph online, but have been unable to find it. It's out there somewhere. The evening before his execution Goldenson was given two hours to visit with his father and sister. It was a difficult meeting as Goldenson was upset over the fact that his father had come to see him for the last time wearing old work clothes. It angered him that his father did not appear to be better dressed for their last meeting. His mother and brothers arrived later in the day and stayed until nine o'clock. When it was time to go the cries and moans of Rebecca could be heard throughout the jail. She held her boy in her arms, kissed him passionately, and whispered loving words in his ears. When the Sheriff led her away Goldenson threw himself on his cot and sobbed for a minute or two. It was the only display of emotion from Goldenson since the day of the murder. He spent the night playing checkers with Jailer Rogers. At ten he requested to see the Catholic priest Father Fasanotti who spent half an hour with him. Goldenson drank a glass of wine and fell into a deep sleep. Just before the appointed hour, Father Franciotti was admitted to the cell and told Goldenson to prepare. He was wearing the suit he had worn throughout the court proceedings. A silk handerkerchief in the form of an American flag was in his pocket. He took the handerchief out and placed it on the table picking up the photograph next to it. It was a photograph of Mamie Kelly. 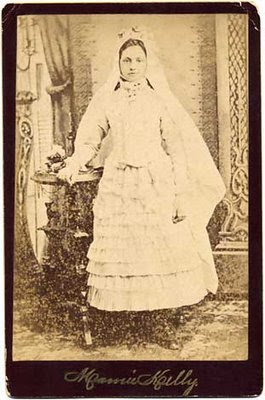 Her communion photograph. The very photograph you see here. The photograph that started this story. Aleck had fastened a slender black ribbon to the photograph and asked the priest to attach it to his wrist. He didn't want the photograph to fall from his hand when he died. He followed Sheriff McMann to the scaffold, Father Franciotti was behind him. He turned and faced the spectators and in a clear strong voice said: "I want to say a few words before I go. I have often reiterated that Mamie was my first and only love. I say now that she was, and I hope I will go to Heaven. I thank you all for your kindness to me. Good-bye." He looked again at the spectators as he stepped backward on to the trap, and said: "I die forgiving you all." He shook hands with all around him and then removed his collar and tie. He lifted the photograph to his lips and kissed it. He asked the deputies for the noose and placed it around his neck. Again he raised the photograph to his lips and kissed it. The black cap was placed over his head. He said a final good-bye to Father Franciotti. "With quick motions Chief Rogers tightened the noose around Goldenson's neck, raised his right hand as a signal, and the rope holding the lever of the drop in place was cut by a deputy, the door swinging open at exactly 12:05 PM. When the rope became taut there was not a muscle moved, and all who saw the execution knew that Goldenson was dead." The body swayed to and fro, and in his dead hands Goldenson held the photograph of his victim. This photograph. This is really an amazing story - can't wait to see how it turns out. The guy really does sound like he was mentally ill. Based on the way you wrote about his reactions, etc, he appears to suffer from some sort of mental illness. What struck me the most about your article though is the image you drew for me of the thousands of people mourning Mamie...which led me to wonder - why was this one case such a big deal? I'm guessing murder wasn't as prolific then - was this the city's first or the first for one so young or the first that was so deliberate? I work in Philadelphia, quickly becoming one of the most dangerous cities. At least once a week some poor soul is murdered on the street - often young like Mamie, often poor. Why aren't thousands of us lining the streets to mourn the loss of these victims? We should. Because as you've reminded us by giving us a glimpse of these long gone souls, every life has value and is worth remembering. Fabulous! Can't wait until Part Three! Superb, as always. I am wondering the same thing as Donner is wondering - why Mamie, why this case in particular? Looking forward to Part 3, because I want to know about the reproduction of the photograph etc. Thank you everyone. Donna raises such good points. Twice Told Tuesday will reprint an article that addresses this very issue. I think you will see the San Francisco of today in the reasons. Have we learned nothing? I think no. Interesting story - will be waiting for Part III. You have a great talent for painting the picture to make it seem as if we were there! Wow, Wow, Wow... what a story. I can't wait to see your footnotes, Maven! I am still writing footnotes. 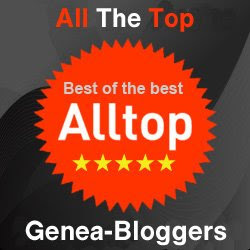 I've read 174 articles and five books. I don't think I'll list them all, except I used them all. In the next section I love the part about "The Missing Brain." Hey, I loved this whole story. Glad you did too!